Over drinks with Steve late one December night at Billy’s, the specter of marriage arose, and he hinted he’d want to know, at some point, what kind of ring I liked. I’ve always loved vintage clothes and jewelry, and some years ago at an antique show, I’d tried on and fallen hard for a filigree band set with a small diamond. Based on that, I told Steve I liked art deco styles. Later, it occurred to me that the filigree piece was the only diamond ring I’d ever given more than a passing glance. I had no idea what I liked. I hopped online and found some websites featuring vintage and vintage-style rings. A few specific settings appealed to me, but most rings labeled “art deco” were actually too flashy for my taste. I wanted something more distinctive than a plain solitaire, but I wasn’t crazy about heavily diamond-encrusted bands or settings that sat really high up off the finger. I’ve never worn a lot of jewelry featuring what I think of as “sparkly” gems, so the popular three-stone setting was, for me, just too much diamond. Yes, I said that. Back to December. One rare day over the holidays when I visited the mall, I stopped by a jewelry store. I felt a tiny bit guilty telling the saleswoman my boyfriend had asked me to tell him what kind of ring I liked. He had, kind of, but it wasn’t like a proposal was imminent. Still, I didn’t know any other way to figure out what worked than to slip a few rings on my finger. I’d determined I liked halo settings, which reminded me of flowers, and since I prefer silver to gold, definitely white gold or platinum. The saleswoman pulled out a couple of rings. I don’t even remember the first one. The second looked too big and out of scale on my thin fingers. When I saw the price tag—more than our entire wedding budget—I quickly handed it back. To each her own, but my preference for smaller stones is aesthetic and practical: had I that much money to spend, I’d rather finance a summer on the coast than wear it on my finger. Especially when it just looked wrong. The third ring I loved: a halo setting, with a just-right center solitaire. The unadorned white gold band was twisted in an infinity loop, giving the ring a casual, almost whimsical vibe that worked with, even echoed, other silver jewelry I wore regularly. (Much of it made by my friend Janna—check out her Etsy shop!) I matched the ring with an infinity twist wedding band in platinum, dotted with tiny diamonds, made by another company. The saleswoman noted she wouldn’t have thought to put the two together, but they really worked. She wrote down the information and gave it to me to give to the boyfriend. The only problem was, Steve hadn’t said anything more about it. It seemed rather demanding to go home and thrust a piece of paper with my ring order at him. Don’t get me wrong—I strongly believe, on the whole, that if there’s something you want in a relationship, you should just ask for it. (Repeat after me: no one can read your mind.) But I wanted proposing to be Steve’s idea. After so many years of not being chosen, I wanted the affirmation, the assurance he was choosing me of his own accord. I tucked the paper into a drawer. Over the next few months I grew increasingly attached to the idea of that particular ring, but I couldn’t figure out how to share the information without sounding like I was expecting or telling Steve to propose. I debated giving my girlfriend the style numbers, but I stopped at hinting he “could always ask Melissa” for insights into my likes and dislikes. In the meantime, I also found a cute sterling ring cast like a tree trunk with initials carved into it and framed by a heart: a perfect placeholder ring for the forester and the writer. Still, I held back, wanting the initiative to be all his. Then, on a trip to Seattle, Steve suggested we stop in a vintage jewelry store. I wondered if he had something up his sleeve or just knew I’d love the shop (I did!). He was trying to gauge what I liked, and the visit re-opened the marriage conversation. That afternoon we perused rings online, and I finally showed him what I’d come to think of as “my” ring. When Steve proposed in Virginia Beach a few months later, I thought at first the ring he slipped on my finger was the exact one I’d shown him. After a bit, I noticed some subtle differences. The twist was more open at the point of joining the mount, and the balance between the center diamond and the halo stones was different. Steve told me he’d only been able to find the specific ring I’d pointed out online, and he was concerned about guaranteeing quality. 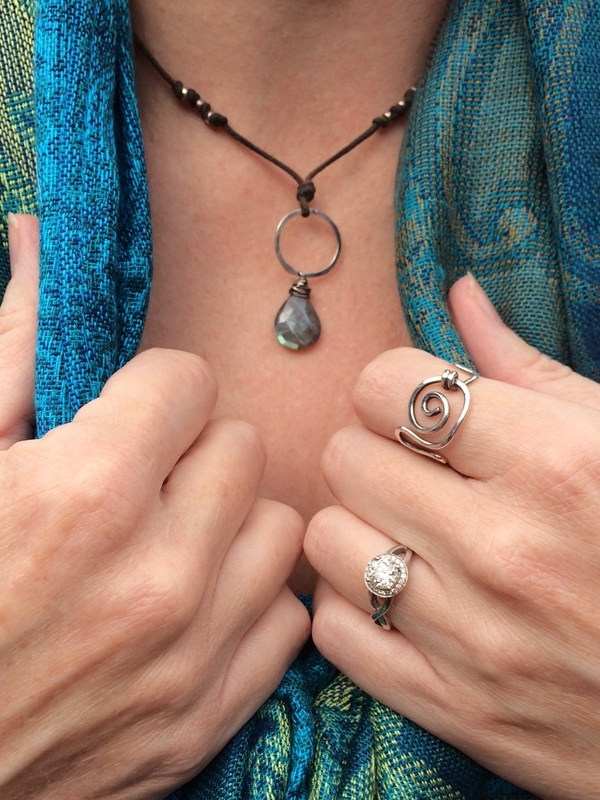 When he went to a local jeweler, the woman took one look at the photo he showed her and said, “Oh, we just got that ring in.” The maker, Sylvie, was different, but the style was a close match. He didn’t see much difference, so he went with it. 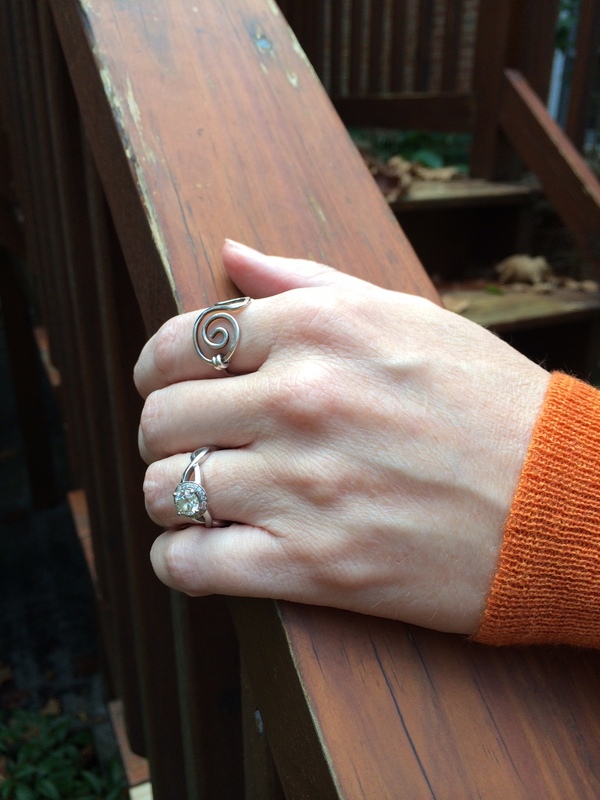 I confess, I experienced a moment of wistfulness; I’d let myself get attached to “my” ring. But ultimately the ring Steve chose and placed on my finger is more beautiful, because it captures his care and thoughtfulness. He searched for what I liked, then, wanting to ensure quality, searched further. 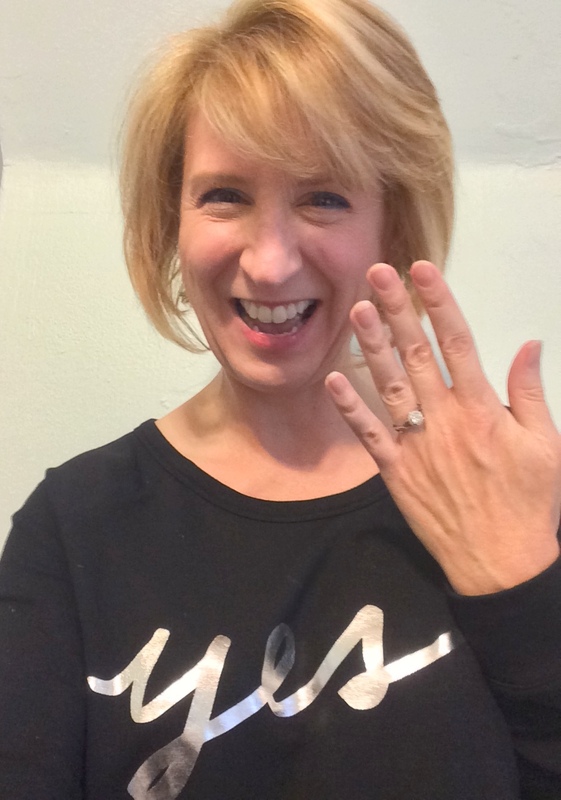 After finding the style at the jewelers, he selected a stone, had the ring ordered, waited weeks for it to come in—he even held off proposing, rather than settle on something else—all because he wanted me to be happy. So the ring I wear isn’t the exact one I’d come to expect. But as M.K. 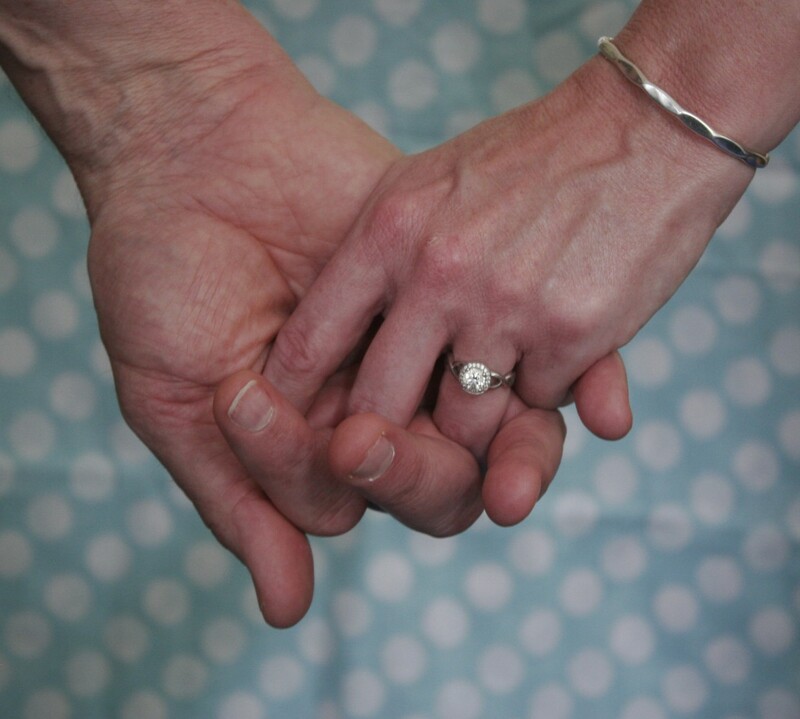 Ryan warns, “When we cling too tightly to our expectations of how it should be, we can easily overlook what is marvelous about what is.” I chose my ring, sort of, but it doesn’t just exhibit my signature style; it has Steve’s signature on it, too. When I look at it, I see his practicality and patience woven in with my playfulness and artist’s eye, our mutual appreciation for beauty in simplicity. I see both of us, intertwined. And that marvelous reality far exceeds any expectation I could ever have conjured alone. Thank you! Yes, I would sometimes see people kind of cut their eyes at my hand, as if they wanted to ask but weren’t sure if they should! It’s perfect and very beautiful!